Made with 100% real premium donor human virgin hair, which is so soft, full and barely sheds or tangles. Swiss lace cap in medium brown and it perfectly fits your hairline, it could suit the skin color of many black women. The glueless cap has clips and is adjustable through the band, so the full lace wig could be worn by a lot of women with different head size. The straight texture is awesome, the hair could reamin its most original state even you wear this wig for many times. 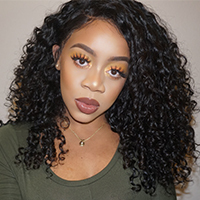 The straight hair used on the wig is unprocessed, high quality Swiss lace is durable and breathable, the band on the wig is adjustable, you can dye or bleach the hair wig, it can be treated in anyway, we accept any return or refund if you receive an unsatisfied virgin hair product from us.